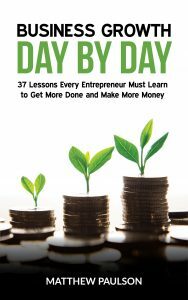 My newest book, Business Growth Day by Day, is now available on Amazon in Kindle e-book, paperback and audiobook formats. Get your copy here. Want to start or grow a business, but aren’t getting any traction? Worried that you chose the wrong business idea? Entrepreneurship is a hard game to play, but it doesn’t have to be as hard as many people make it out to be. Matthew Paulson outlines the business growth hacking and personal development shortcuts that multi-millionaires use to get ahead of the game in Business Growth Day by Day. Working harder isn’t the answer. Putting in enough hours usually isn’t the problem. If you are like most entrepreneurs, you are already working harder than anyone else. What’s really holding you back from building a successful business? If you’re like many entrepreneurs, you’re focusing on the wrong parts of your business. You’re doing work your team members should be doing. You haven’t paid enough attention to critical marketing tasks. You need to fine-tune your business model and pay closer attention to the books. Business Growth Day by Day reveals the commonly-made, but little-known mistakes that almost every entrepreneur makes, which prevents them from achieving business success. The simple strategy that millionaires use to become smarter than everyone else. How to recognize and attract new business opportunities (and avoid the wrong ones). The single best way to make more money than you are today. Why using the word “no” might be the key to unlocking business growth. Why SEO, Google AdWords and Facebook Ads might not be right for your business. The biggest small business mistakes commonly made by new entrepreneurs (and how to avoid them). How much your business ideas are actually worth–they may be less than you think. How your business can maintain an 80% profit margin, each and every month. How to effectively pitch your small business and yourself to others. When you should quit your day job and go full time with your business. What other business books aren’t willing to tell you about entrepreneurship. Whether you should make a small business plan or just get started launching your business right away. Matthew Paulson, Founder of MarketBeat.com, USGolfTV and GoGo Photo Contest, has weathered the failures and triumphs of being an entrepreneur for more than a decade. 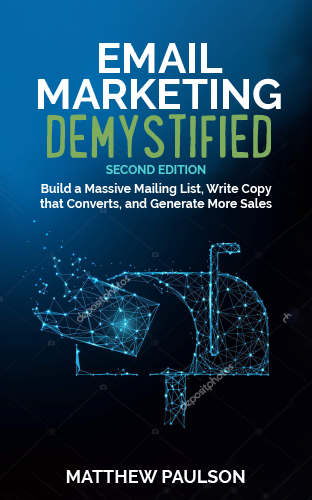 He has built, grown and sold multiple six-figure and seven-figure internet businesses using the strategies outlined in this book. Matthew believes that entrepreneurship is the single best way to help others and get what you want out of life. Through his business books, Matthew teaches others to create profitable businesses and achieve financial freedom. Business Growth Day by Day has been referred to as “one of the must-read small business books to grow your company in 2016 and beyond.” Business Growth Day by Day is chock-full of unique business ideas, plans and strategies that will help you take your company to the next level. Click here to get your copy of Business Growth Day By Day and begin your 38-day journey toward personal and business success.